Police have launched a murder enquiry after a man died and two others were injured following an incident in Clacton town centre. Police have charged a 21 year old man with murder, attempted murder and two counts of making threats to kill following the death of a man at Clacton town centre on Monday. The victim, who was formally identified by his next of kin yesterday, was James Gregoire, aged 54. 21-year-old Darren Gilbert who is unemployed and lived at Holland Road in Clacton will appear in court in Colchester later. James Gregoire was killed on Monday. Credit: ITV News Anglia. Police have officially named a man who was killed in Clacton earlier this week - and confirmed he had been stabbed several times on his upper body. James Gregoire, 54, died following the attack at Rosemary Road at about 11.45pm on Monday April 13. A 21-year-old man who was arrested at Clacton on Tuesday on suspicion of murder remains in hospital receiving treatment. A post mortem examination confirmed Mr Gregoire died from several stab wounds to the upper body. 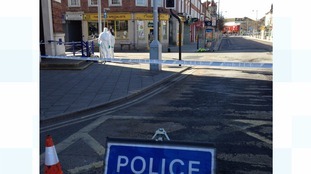 Large parts of the seaside town of Clacton were sealed off for most of the day as police launched an inquiry into the murder of a man in his 50s. The victim was stabbed in the street, another man in his 20's needed hospital treatment. Tonight a 21-year-old man is being questioned. A 21-year-old man from Clacton has been arrested on suspicion of murder. He was arrested in the town at 11.40 this morning. A murder inquiry's underway in Clacton after a man was killed last night. Officers are trying to arrest the man believed to be responsible.